A Japanese Halfie in Canada: Why the Long Face?? I haven't felt like blogging my lately; part of it is that I've lost my sense of humour...I'm not as funny as I'd like to think I am, but I try...Sadly. Hahaha! I've felt bloody exhausted lately. I'm working out again (walking since it's cooled down...A little), and work has gotten nuts over the past few weeks. Maybe it's the disappointment I've been experiencing? I won't be going to Sri Lanka due to visa/residency/passport issues, but let's not even go there because I'm trying not to be frustrated with the whole situation. Could be that I'm worried about my father. He's going to undergo surgery in a short while and he's never had surgery. Although it's a minor surgery, every surgical procedure has some risk and I'm not feeling to happy about the fact that I wont be in Canada with my father or supporting my sister. Secondly, I've been shopping. I went out with my student a few weeks ago and we had lunch at the Indian restaurant Asha's. 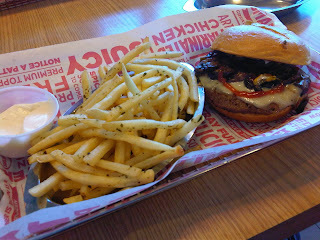 It's a chain, and although there's a location just down the street from me at Spoons, we opted to go to Marina Mall. Afterwards we shopped and my student, obsessed with perfume, bought some new scents. I purchased some new *WARNING! TMI in about five words! * undies at Victoria's Secret. Why didn't someone tell me about these amazing undergarments sooner?!? They are amazing and puts La Senza (the brand I usually purchase in Canada) to shame, especially since La Senza is a subsidiary of Limited Brands Inc. which is the owner of Victoria's Secret. The two have a bit of a tumultuous history in Canada, but the hope everyone had when Limited Brands bought La Senza was that this meant Victoria's Secret would FINALLY come to Canada. My sister has informed me that it has and did so quite awhile ago! WOOOHOOOOOOOOOO!!! Dessert (my student's suggestion) @ Chocolate Bar. I think this is their version of Bananas Foster. I also made a shopping trip out with the beautiful, and always fun, Turks. Turk #1's sister was visiting Kuwait and they had asked me to go out make-up shopping with them. I happily obliged and even bought some make-up myself, surprise, surprise...Not. Hahaha! I was very good and only bought one nail polish (just a base coat! It doesn't even have any colour!!! ), and a lipstick (who knew?). I ONLY purchased the lipstick because I was meeting the Irish chef and his friend, The Canuck (honestly, the Canuck lives in Guelph, sooo close to my home town! ), at a...Shindig after my shopping trip and I'd forgotten all of my make-up (including the one thing I can't live without in the desert: lip balm) at home. I should mention that I look dead without any colour on my lips. It's like my lips don't have any pigmentation, so I had to *wink-wink* buy lipstick!!! It was cheap. Sue me. Lol! This weekend I've been working mostly, but I did call up the Georgian to meet for coffee, which became lunch at Smash Burger (she lives next door to the joint and hasn't eaten there before! 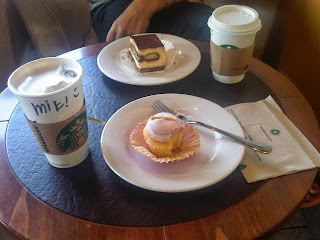 ), then coffee and dessert at Starbucks. She's awesome. I really, really like her and I'm so glad that she's still here. The baristas here are AMAZING and patiently tried to make a London Fog for me (they'd never heard of it. Luckily I used to work for Starbucks for MANY years and could still remember how). I couldn't resist the raspberry cupcake. The Georgian opted for a latte and a slice of tiramisu; so well paired compared to my mish mash....That's me though. A big ol' mish mash of weirdness! Food has still been a constant companion of mine (as you can see by the pictures). I really need to take a photo and post it soon so my father knows that, despite my voracious appetite, I haven't gained TOO much weight, hahahaha! I've started walking again since the weather has cooled down a bit, and by a bit I mean a few degrees, lol! I've also adopted some plants that I still haven't managed to kill off yet-to their relief. They're giving me positive energy! I try to talk to them, but I find that just singing and touching the leaves is going alright...They haven't died on me yet, so my singing can't be THAT bad! They're being potted this weekend, so I'll post an updated picture soon.